Last Sunday, I watched the U.S.A. win the Ryder Cup, a victory spearheaded by an unlikely individual named Boo Weekley, a victory that made all who watched proud of our Americans, and our America. We saw all of the characteristics that made our country great: tenacity, teamwork, honesty, competitiveness, friendship, and fun, lots of fun. I felt great. Later that same night, I watched 60 minutes which featured an interview with John McCain. This depressed me. 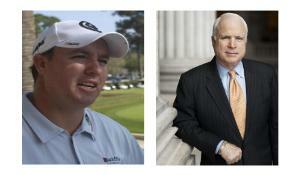 I got to thinking…John McCain could learn a lot from Boo Weekley. With the election season upon us, we have entered a season of untruthfulness, lies, and deceit. John McCain has said in the past that he was against offshore drilling, against regulating the financial community, and against dirty politics. Now that he is running for president, he has changed his tune on all three of these things: He leads the cause for offshore drilling and says his opponent has been slow to adopt this policy. Since the financial fallout in the markets this past week, he has proclaimed the need for financial regulations that he has never before supported and has recommended the termination of the Secretary of the Treasury Hank Paulson. And, after claiming that he dislikes dirty politics, he has championed a sleazy campaign against Barack Obama likening him to Britney Spears and Paris Hilton. All the political lies are enough to make one…consider a redneck for President? Last weekend, one the greatest sporting events of the year took place: The Ryder Cup. For the non-golf fans, this is a three-day golf tournament, played just once every two years, which pits the United States against the Europeans. The Americans have been dominated by the Europeans in the recent Ryder Cups in spite of having a better team. The tournament holds a special place for the golfers, and golf fans, because it is the one time when golfers play as a team, not as individuals playing for millions of dollars. The experts say that the Americans have lost with such frequency in the past decade because they’re too selfish and unable to play as a team. For the first time in many years, the European team was favored to win. Two reasons account for this: One, Tiger Woods is hurt. And two, the Europeans have become better world golfers. But this year, the Americans won on the heels of several inspired performances and great teamwork. One of the substantial contributions to the team came from a golfer relatively unknown outside the golfing community: Boo Weekly. What refreshing honesty! Most golfers would blame the green, the weather, the equipment-anything but themselves. The next week Boo won his first golf tournament and has since become one of the best golfers in the world. But, most importantly, he hasn’t allowed his accomplishments to overshadow himself; he hasn’t changed. Boo went on to stunning victories in the Ryder Cup this past weekend and boosted the U.S Team to a win not only with his golf but with his humor. “The Ryder Cup didn’t change Boo. He just tells it like it is and it’s so refreshing,” said one of the golf columnist. The initial appeal of John McCain was so similar to Boo-a maverick who just tells it like it is. And so, as I watched 60 minutes last Sunday, and heard John McCain telling me what he thinks that I want to hear, I wondered: Where has the real John McCain gone? Where is the Maverick? Boo would never do me like that! Nobody agrees on the spelling of Boo Weekley. Google provides more hits for his name spelled incorrectly-Weekly-than it does for his name spelled correctly, Weekley. John writes that Boo Weekley is his favorite new golfer because he’s “willing to jump in a cage to wrestle an orangutan at a state fair in an effort to win a few bucks.” Apparently, he told this story to his rider cup teammates to lighten the mood. Mike Sigers, in Speaking of Boo Weekley, creates a Jeff Foxworthy-like spoof saying: If you ________ , you might be from Milton, Florida. Ryan Wilson writes about Boo’s Ryder Cup triumphs over Europe in his article Lee Westwood Isn’t Impressed With Boo Weekley’s Between-Shot Antics. And finally, Rany Mell talks about Boo Weekley inciting a rock concert like atmosphere at the Ryder Cup. Of course, there’s much more. You can always search google for Boo Weekley, but don’t forget to search for Boo Weekly too! EDMOND — When Benjamin Franklin was dispatched to France as ambassador of the United States in 1776, he won the hearts of the French through his authenticity. Rather than take on an affected and phony continental style, Franklin eschewed the powdered wig of the European gentleman and donned the fur cap of an American frontiersman. Original genius and polymath, Franklin understood that the French would see through any false pretension but respect an authenticity that sprang from an unpretentious and naive love of country. Nothing exemplifies Obama’s antipathy for American culture better than his statement that Americans “cling to” religion and guns out of frustration or bitterness. We only can suppose that Obama regards religion or firearms as aberrations that need to be eradicated. Of course, both guns and religion are essential aspects of American culture. The United States was founded by people seeking religious freedom. Does the word “Pilgrim” ring a bell with anyone? Our freedom and the right to self-government were won by farmers with guns. The American Revolution started when the British marched to Concord with the intention of confiscating colonial arms. Both the right to “keep and bear arms,” and the right to “free exercise” of religion are enshrined in the Bill of Rights. We have come a long way when the presidential nominee of a major political party regards the exercise of fundamental rights as a mental aberration. Interesting post from “a friend”. David Deming, in the article posted above, concludes that Obama is a “vapid demagogue”. “Vapid” means lacking liveliness, animation, or interest. John McCain, based on his own advertisements, would disagree with that assestment. And to suggest that Obama is a “hollow” man lacks any understanding of who Obama is as a man. I know of no greater conviction a man could have displayed by risking his whole political career in saying that “The Iraq War” was wrong. Whatever one thinks of the Iraq war, it is irrefutable that the reasons given for this war were lies. In the end, thousands of Americans and Iraqis (civilian Iraqis) are DEAD. I think of this war today as our economy faces ruin and the government is requesting a $700 billion bailout. I presume “a. friend” supports John McCain. I always liked John McCain and thought he was someone who would tell the truth. I have been very disappointed in his campaign though as I believe he has deviated from his “tell like it is” manner. Also, “a. friend” should know that I am supporting his Milwaukee Brewers as they still have a chace to make the playoffs!